When a factory owner is murdered by an ex-employee the guilt appears certain and the case cut and dried. 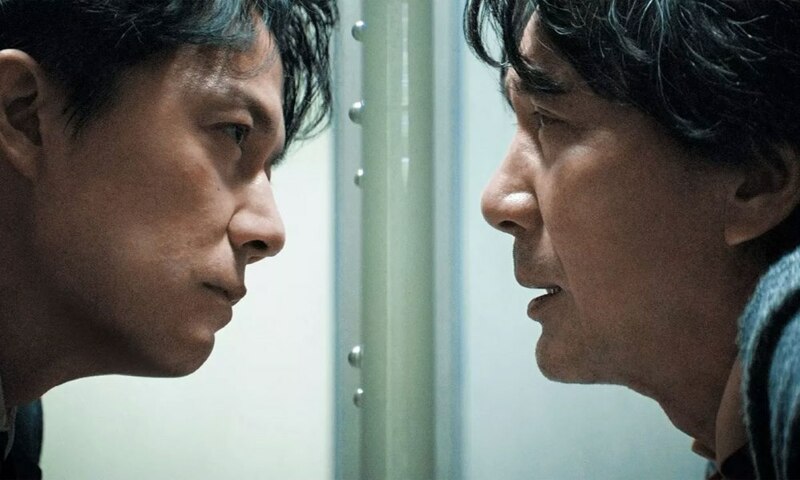 However, an ambitious lawyer soon discovers that there are layers of guilt and ends up wondering who can judge who in Hirokazu Kore-eda’s The Third Murder. Japanese auteur and festival favourite Kore-eda has made his reputation on the festival circuit as a wry observer of Japanese domestic life, with a strong emphasis on familial relationships. The Third Murder suggested a move to the crime genre, but this courtroom drama aspires to be a metaphysical examination of judgement, grace and guilt. Shigemori (Fukuyama Masaharu, last seen in Kore-eda’s Like Father, Like Son) is the son of a judge, an experience lawyer who is called in by his older associate Settsu (Kotaro Yoshida) to help close a case. Misumi (Yakusho Koji) has already confessed to the murder. He took the victim – his ex-boss – to a patch of waste ground where he beat him to death with a wrench and burned the body with gasoline. He’s already a murderer, having killed two loan sharks decades ago, a case that was tried by Shigemori’s father, who now regrets his leniency. However, Misumi’s job is simply to try to get a life rather than a death sentence. His case isn’t helped by the shifting of Misumi’s story and the inconsistencies of some of the evidence. During a series of conferences with the prisoner, all filmed in a metallic-coloured cell with a thick pane of glass separating them, Shigemori finds it increasingly difficult to figure out his client. Is the man a total sociopath? Or is something else going on? One way to resolve this would be by talking to Misumi’s daughter, who could be called upon as a character witness, but she lives far to the north and expenses won’t run to it. There are other daughters, however: the daughter of the victim, who walks with a brace on her leg, and Shigemori’s daughter from his failed marriage. He has been too busy and the girl has taken to shoplifting and getting into trouble to gain his attention. The scene with the two of them puts Kore-eda firmly in his comfort zone and suddenly we care much more. Fathers and daughters create new connections between the criminal and his victim, the lawyer and his client. The problem is that the murder story itself begins to shift through a variety of versions so much so that even the film begins to lose track. The confusion is underlined by a long scene in which the reflections of the lawyer and his client merge as they face each other and try to get at the truth: a truth which needs to be negotiated in such a way as to protect as well as reveal. With a heavy lacing of Christian imagery and the use of a murder as a moment of larger metaphysical question of truth and guilt, The Third Murder feels like a Dostoevsky retelling of Akira Kurosawa’s classic Rashomon. It doesn’t quite make it – those are after all big boots to fill – but Kore-eda has unquestionably added a new, intriguing angle to his meditation on family life in contemporary Japan, complete with a haunting score from Italian composer Ludovico Einaudi.